Jamie Smith, 44, is from Coventry. He lived with us for around two months last year after being self-referred following a difficult period in his life. Jamie had an accident at work which resulted in a badly damaged shoulder and elbow. He couldn’t work and his relationship broke down which led to Jamie taking an overdose in an attempted suicide. He then became homeless after having to leave his ex-partner’s and lived in his van for 8 months before coming to see us. Jamie suffered from depression and stress since his accident at work and was taking anti-depressants. Jamie is now off all anti-depressants, and after 3 years clean from drugs has turned his life around. 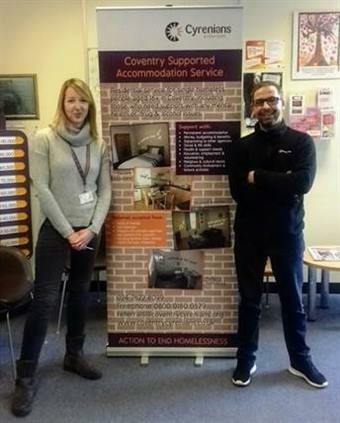 He is assisting project managing a housing renovation in Coventry to learn the trade to turn it into a full time job and has a property in Spain. Jamie has previously volunteered at an Oxfam shop and wants to do voluntary work for us. Jamie said we really helped him at a low period in his life and wanted to give something back as he will never forget the help we gave to him. 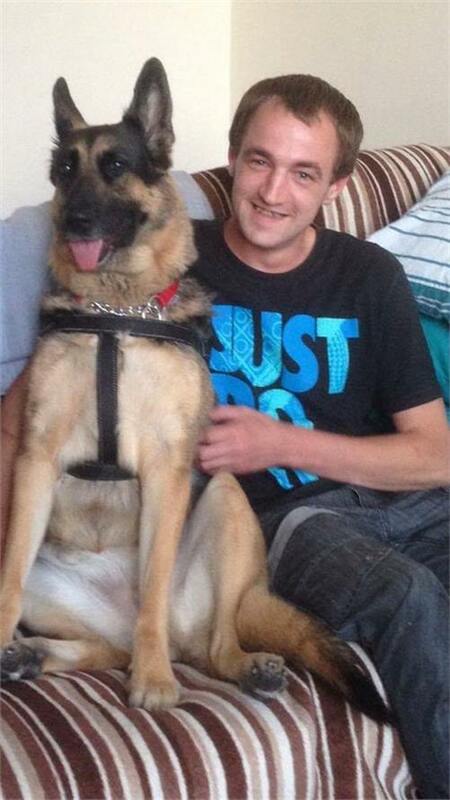 Jamie donated £400 yesterday with money he won in compensation for his accident, with more promised. Not only did he return to say thank you, he wanted to support us financially so we could help support others in similarly difficult situations. The young person was referred to AIMS by school at the recommendation of Children and Families First services. Concerns ranged from behaviour in class, non-attendance, ill health (physical and emotional) and eating behaviours, given the young person was very underweight. Issues at home had resulted in relationship breakdown, with the young person having had arguments with parents and gone missing, resulting in police involvement. Parental health was negatively impacted and this had also impacted on a substance use basis. Through home visits and one to one interventions it was determined that school were unaware of an educational needs related diagnosis and health issues which were from birth, for example, and implemented changes of support to help with this. Feedback from the young person was that they felt they had had excellent support and overall experience, with communication, health, education and family relationships all having improved. The parents felt that they had received “tremendous help” in improving family relations and school related matters, and even though the case had been closed recently provided an update regarding exam results, which they were delighted about. The young person passed 7 exams, including 2 A grades and had been accepted into the 6th Form, and the parents believed that this success was fundamentally achieved through Cyrenians “help, support and encouragement” for which they remained very grateful. A refugee (who would like to remain anonymous) who came to the UK to escape their country’s national service conscription was recently awarded a grant by Coventry City Council thanks to our support. They are from Eritrea, where their national service programme is widely considered ‘miserable’, ‘useless’ and ‘akin to slavery’ by the likes of The Economist and The Guardian. They found asylum in the UK, gaining temporary accommodation with the National Asylum Support Service, but were asked to leave as soon as leave to remain was granted. 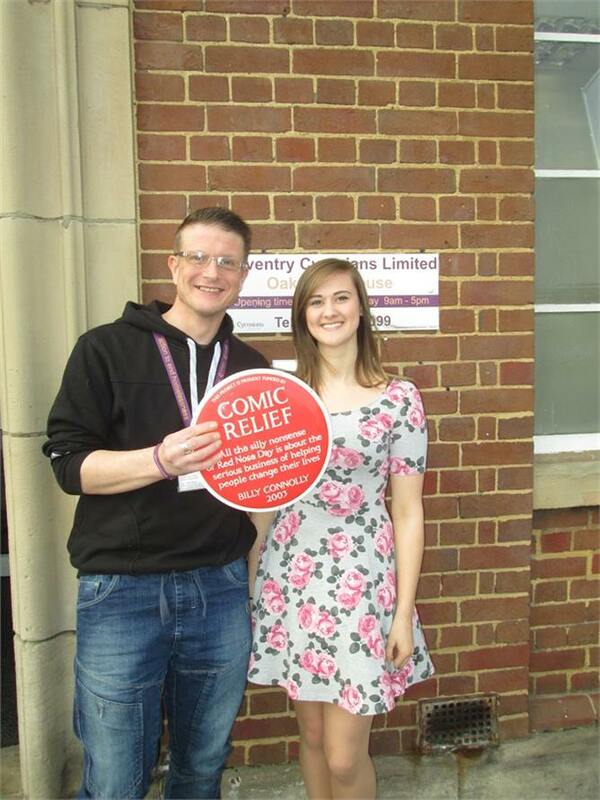 They came to Coventry because of a friend who was already here and had previously stayed in our accommodation service. 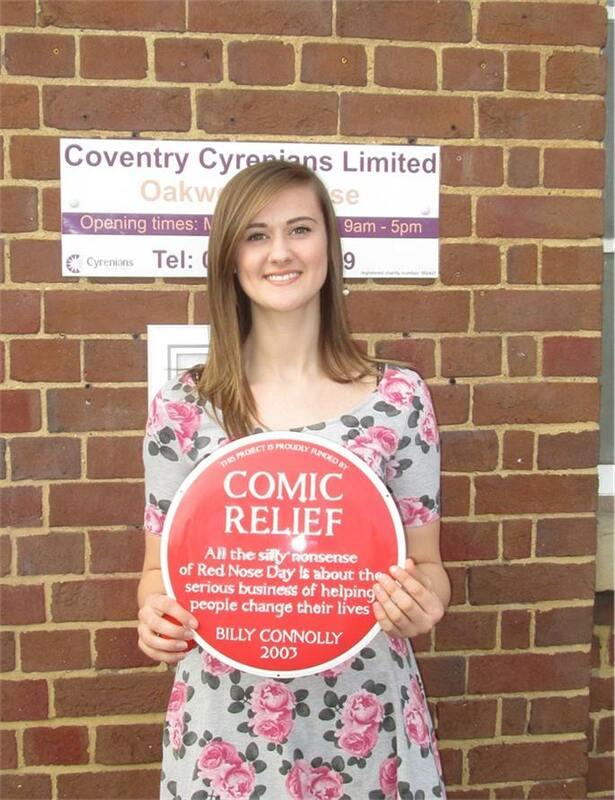 They were accommodated by our team and supported to settle within Coventry. They set a target that they would like to move out within a year and find their own tenancy. Throughout their time with us, they attended an English language course at a local college and completed work experience at Amazon. We also helped them receive medical treatment to cure their blindness in one eye. They met their target of moving out within a year, moving in with Whitefriars housing association in July 2017. However, this was an unfurnished property, without the household necessities required to make it habitable. We therefore supported them to complete an application for a Community Support Grant with Coventry City Council, which was accepted. They qualified for household goods including; a fridge/freezer, bed, kettle, saucepan set, washing machine, sofa, cooker and crockery. The grant from Coventry City Council has enabled them to settle, find independence and integrate into the local community. Whitefriars - a local housing association - continue to support them and ensure they maintain a stable tenancy while continuing on the right path. With their newfound furnished tenancy and language skills, they intend to find paid employment. They recently attended an interview with Amazon for a paid position, and we hope they are successful in all future endeavours. Abdul worked as a translator for UK Armed Forces in Afghanistan. He resettled in the UK due to life being at risk in Afghanistan. He previous tenancy was funded by C.A.B. He was then housed by Cyrenians in June 2016 after C.A.B. funding and support was withdrawn. Cyrenians supported Abdul to move on into his own tenancy with Whitefriars and helped with utilities and secured a Community Grant for furniture. Nardinder - a support worker based at one of our supported accommodation houses in Stratford Upon Avon -received a letter from her client thanking her for all her support. Click the link below. A young female moved into the accommodation when she was 16 years old. Her parents had asked her to leave their house. She was housed by Cyrenians and continued with her education. She managed to maintain her grades at sixth form and finished her first year of sixth form and then finally completed her A levels. She was offered a place at University studying politics. Whilst in Cyrenians accommodation she gained new skills to help her live independently as this was her first tenancy away from the family home. She has been able to use these skills to manage in her own accommodation at University. Her success story was shared during a local Harvest Festival and a member of the congregation donated £25 to help her towards her education. We have been working alongside Suki’s Canine Rescue Crew to help a young man and his dog Molly who found themselves homeless. Molly was placed into foster care with Suki’s Rescue and Dean was accommodated in Cyrenians supported accommodation. With the help of his Cyrenians Housing Support Worker , he successfully secured his own tenancy and has now moved into his accommodation and has been reunited with Molly. Whilst in our accommodation Dean volunteered with both Cyrenians and Suki’s Rescue and has become a valued member of both teams. Dean has helped Cyrenians by collecting and delivering donations from the public, collecting bags of donated goods and clothes for our social enterprise shop Windsors. Dean continues to volunteer with Cyrenians as he feels he gets a lot of satisfaction and wants to help others who find themselves in need of help. Virgin Trains kindly donated a number of bikes to Cyrenians to either sell in the shop for the profits to benefit the charity or donate to the clients who needed them. A few of our service users have been involved in making the bikes roadworthy and Dean received one of the bikes to enable him to carry on volunteering with us. We wish Dean and Molly all the best for the future in their new home and a big thank you for the time he gives to Cyrenians. Zoe first accessed the Young Persons Alcohol and Mediation service in October 2014.
her parents and her alcohol use. She was at the point of leaving home when her school referred her to the service. Her parents did not want to engage with the service but her older sister who also lives at home stepped in and agreed to mediation with Zoe. “I don’t drink anymore, it was excessive. I am now a different version of myself, a totally different person. I am now conscious of what I do when i go out with mates and who I hang round with. I still enjoy going out but now I have no regrets the next morning. Andy my Cyrenians worker has given me the coping mechanisms and provided information so I don’t need to drink anymore. Mediation sessions gave me the opportunity to express what I am feeling and helped me to find solutions to problems. I had sessions with my worker at Compass who helped me understand why I was drinking and how to not need alcohol. My relationship is better with my sister as we talk more now and understand what we are both feeling about home life. I had counselling but I don’t need that now – it helped a lot. I am now looking forward to going to University next year to study Zoology, something I did not think I would be able to achieve when my life was so out of control”. We supported a 26 year old female who was referred to us by Stratford District Council. She was rough sleeping in a hand made shelter and her boyfriend was rough sleeping with her as he did not want to leave her on her own. She had a history of depression, anxiety and poor family connections with mum, dad and sister and had anxiety going out alone as she was raped in 2009 which left her feeling vulnerable. She had a 10 year old son who social services put into care and was due to be adopted. When we initially met her she was very low in mood and tearful due to her situation. We signed her onto our Stratford Outreach Service and supported her to change her benefits from JSA to ESA as she did not feel able to work at that time. We also helped her register with a GP who prescribed medication to help her manage her anxiety and to register with a dentist. She was also referred to other supported housing projects, however within 4 weeks of supporting her, a room became available at our Stratford residential service, and we continued to support her successfully during her stay with us. Initially she got into arrears as she was drinking problematically at weekends and would get involved in arguments and become abusive, which resulted in the police being called. We referred her to the Recovery Partnership which she did not attend, but managed to reduce her drinking herself. In Jan 2013 she informed us that she was 6 weeks pregnant. She was aware that social services would be contacted due to previous concerns regarding her son; however this was a turning point for her as she cleared her arrears over the next few months. She linked in with support better and kept all her appointments with social services as well. As social services were happy with her progress and the changes she had made, she was able to keep her baby. Whilst in our accommodation she received support to move on and was accepted by Stratford District Council. Her banding was increased by the council and she was placed on gold plus and began bidding for accommodation with weekly support. 9 weeks later she was offered a 2 bed flat which she viewed and accepted and moved in with her boyfriend. We continued to support her on resettlement for a further 10 weeks to help her settle in her new home. We helped her set up direct debits and did some fund raising at a local school and managed to get baby clothes and items for her. She had a baby boy and is still living at the same address with her partner and is looking forward to her third child. Rosie was renting a room in a shared house for nearly 12 months, where she was severely harassed by the other male resident, which has had involvement from the police, resulting in her being referred to our Residential service for her own safety. She was moved in to a hostel and engaged well in support planning, where she worked with us towards dealing with some of her issues in preparation for moving on to independent living, as part of a resettlement programme. Rosie has experienced abuse throughout her life, she has had a physical and mentally abusive relationship with her mother, who commanded custody of her first born daughter from a very early age, this has effected her relationship with her mother and they have no contactwith each other. Rosie has been in domestic violence relationships, in which she was isolated from her friends and forced into prostitution and almost bankruptcy. As she has had to relocate in excess of 8 times due to continued harassment from the same man, she has been required to set up a new life, and attempt to start all over again, in and out of hostels and temporary accommodation. Whilst living in Cyrenians accommodation, Rosie made some very good friends, and engaged in support from CRASAC, completing a course of counselling therapy. She has also built up strong ties with a local band, and regularly competes in competitions, and performs at festivals and galas. As Rosie acquired her own tenancy, she has taken huge steps, to rebuild her life, with the assistance of our Housing Support service.